SAPIEN Technologies is pleased to announce that PrimalScript 2018 will support Git as a version control system starting with version 7.4.114. 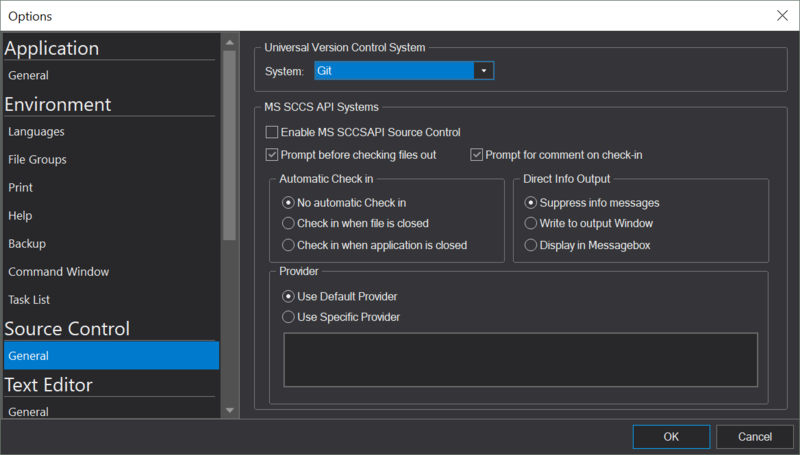 Support for VersionRecall will remain as well as support for MS SCCS API (Microsoft Source Code Control System API) based systems, for example Team Foundation Server. It is important to note that MS SCCS API systems and Git are mutually exclusive—so if you are using a legacy system you cannot use Git and vice versa. Support for Git is routed through a new interface called Universal Version Control System. The requirements are very basic: any system that can be supported must be command-line based, it’s output needs to be able to be redirected, and you will of course need to install it. You can download Git here: https://git-scm.com/downloads. Please note that you must choose the Use Windows Command Prompt option during installation. PrimalScript looks for Git in its default installation location under C:\Program Files\Git. If you installed it in some other location you will need to modify some files before you can use it, but more on that later. To enable Git in PrimalScript, navigate to File > Options > Source Control > General and select Git. Now when you open a file the Tools tab will have a Git group with a variety of commands. Here is a close-up view of the available commands. These are some of the most common, basic Git commands and should let you do most things with the push of a button. In the next blog article about this new functionality we will show you how you can customize these commands and add your own. On the Tools tab, in the Git group, press Init to add a Git repository to the folder where the file is located. Next, add the file to the repository by selecting Add. This will also do an initial commit. Each Commit will prompt for a comment and that comment will be shown in the subsequent tool output. That’s it for now. If you are not familiar with Git we recommend reading up on it before experimenting with the other commands. This is the beginning of our support for Git and similar source code control systems in PrimalScript, so stay tuned for new features and additional UI elements in the coming months. In a future blog post we will also show you how to customize these commands or even add your own. Having some issue getting this to work with an existing folder that is in source control. Seems a verification issue. I tried to generate a key but it looks like it defaults to user@machinename regardless of setting my username by going to GUI (from PS) and then entering it there as user@domain.com. Also, once I generate a key in PS GUI, does not seem an option re-generate/delete existing key. Any thoughts or is that the next article? As always, the forum is the place to ask for help, support or provide feedback.